Power Washing for Your Teeth? You’ve heard about power washing your house, your deck, your car, your driveway – but what about your teeth? Now that’s something to smile about! The most often requested service in our office today is tooth whitening. Everyone wants a whiter smile – it brightens up your whole face! If you find that your smile is getting a bit dull – give Cutbirth & Sanderson General Dentistry a call so we can explain power whitening and what it can do for you! What is Dental Power Whitening? Power whitening is safe, fast, and effective and the results are incredible! Power whitening is a technique that uses laser bleaching to whiten your teeth. The procedure takes about an hour and you leave our office with a brand new smile and the confidence that goes along with it! 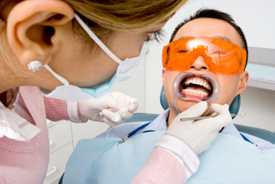 First, we remove any plaque and surface stains from your teeth. Next, we apply a whitening gel to your teeth that is energized using a powerful laser that totally whitens your teeth in about an hour. The results are dramatic and easily achieved in far less time than other teeth whitening methods you might try at home. Of course it’s safe, otherwise we wouldn’t be using this or any other technology at Cutbirth & Sanderson General Dentistry! The technique is fast, safe and gentle and it doesn’t harm your gums, your teeth or any previous dental work you’ve had done. Power whitening makes your teeth look natural – and not artificially white in any way. It actually brings out the natural color of your teeth, before years of staining, age and wear and tear took their toll on your teeth’s appearance. Although some patients report some initial tooth sensitivity immediately following the procedure, this generally goes away within a day. Many of our patients have found power whitening to be the fastest and most effective way to whiten their teeth. If you’d like to know more about this process or look at the “before” and “after” photos of patients who have tried the power whitening technique, by all means give us a call. We’re only too happy to show off the remarkable results of this procedure!